Americans are sometimes astonished when foreign leaders who are responsible for horrendous atrocities are treated like statesmen in their own countries, asked polite questions by journalists all too aware of the consequences of speaking truth to power. So let’s talk about Henry Kissinger. Photo: An MSNBC appearance from 2011. 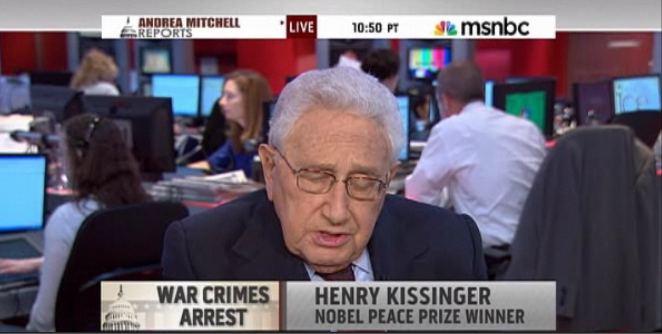 Some viewers were disappointed to learn that the arrest referenced on screen was not in any way related to Kissinger. And I’m going to say it up front, I don’t give advice obviously, I report on what others do. But I would send Henry Kissinger tonight to Moscow to talk to Putin and see what he can find out and decide where we should go from there. I’m proud to be a friend of Henry Kissinger. He is an extraordinary man. This country has lost a lot by not having him in a position of influence and authority. Of course, a clear vision of Kissinger would help too. The record is well-documented, from backing a coup in Chile (“We will not let Chile go down the drain“) to supporting the dirty war in Argentina to Indonesia’s bloody campaign in East Timor. Photo: 2.8 million tons of bombs were dropped on Cambodia during the Vietnam War–overwhelmingly on Kissinger’s orders (Walrus, 10/06). 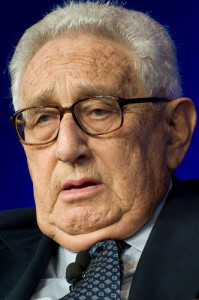 Kissinger is most closely associated with the wars in Vietnam and Cambodia. Of the latter, he famously delivered this order: “A massive bombing campaign in Cambodia. Anything that flies on anything that moves.” Credible estimates of the number of people killed as a result of this order range as high as 800,000. Mr. Kissinger, every time we interview you, we hear from people who object, who say they have no interest in your opinion because of your role during the war in Vietnam, especially the bombing of Cambodia and Laos. How do you answer that? Zwillich: Excuse me, sir. Uninhabited goes against the facts of history. There were hundreds of thousands of people killed in that campaign. Kissinger: Wait a minute. Ignorance is no excuse for being insulting. The bombing that people are talking about, that they’re criticizing the White House, was a 10-mile strip in which very few people were killed–if any. It is difficult to imagine that Kissinger really believes that the US bombing of Cambodia possibly killed no one. I served in a difficult period of various wars in which we did the best we could to bring an end to the wars and begin a structure of peace. And really, for 50 years after, an interview that would spend this much time on this is outrageous. an issue that your audience cannot possibly know much about. This happened over 40 years ago, it has been exhaustively discussed. It is a reflection of a period in which the divisions in America were so great that opponents seemed to take a perverse pleasure in charging the people with whom they disagreed on other points with sort of criminal activities. Kissinger takes part in a Stephen Colbert comedy sketch. He is correct about one thing: Most Americans are probably unaware of this record. Not because it does not matter, but because the “elder statesman” who oversaw these policies is treated as some sort of oracle by elite media. Suppose, however, that someone were to unearth a document in which Milosevic orders the Serbian air force to reduce Bosnia or Kosovo to rubble, with the words “Anything that flies on anything that moves.” The prosecutors would be overjoyed, the trial would end, and Milosevic would be sent off to many successive life sentences for the crime of genocide–a death sentence, if it followed US conventions. One would, in fact, be hard put to find such an explicit order to carry out genocide–as the term is currently employed with regard to crimes of enemies–anywhere in the historical record. In this case, after casual mention in the world’s leading newspaper, there was no detectable interest, even though the horrendous consequences are well-known.